Wow! A plug-n-play turntable solution for N-scalers. Kato has brought the 20-283 Electric Turntable to the USA and it works brilliantly. The model is expandable and features the same reliability and ease of use we have come to expect from Kato. 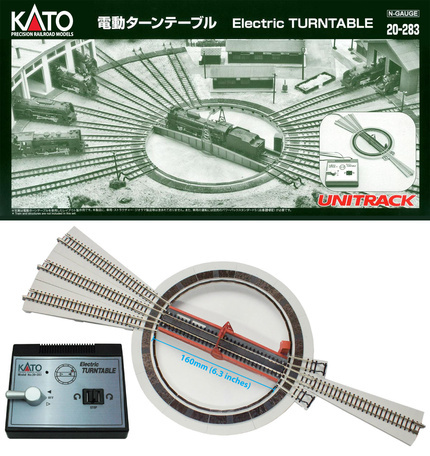 The turntable is expandable to thirty six (yes, thats 36...) roundhouse tracks using the Kato 20-285 or 20-286 Turntable Extension Track Sets that can be powered indirectly using the power-routing bridge or directly using the Kato 20-284 Turntable Extension Track Feeder Kit. 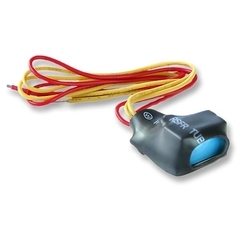 The model is designed for use with DC power using the Kato 22-014 DC Power Pack. Converting the model to DCC is very simple. All you need in addition to the model is a DCC auto-reversing unit like the MRC AD520, the Digitrax AR1, or the DCC Specialties On Guard! DCC Auto Reverser. Next, replace the throttle back making sure the lanyard is in place around the screw post protrusion and replace the screw. Use a light hand as you do not want to strip out the threads in the screw post protrusions. Please note my wiring is slightly different than what is recommended by Kato in their instructions. This method is using the bridge as the shorting section. I do not use any insulated rail joiners in this configuration. Once the Kato Turntable Controller is wired and installed, move the track power direction control lever to either position. There is no need to ever move it again. The DCC Command Station is used to control the direction and speed of the locomotive. Control and use is the same as it would be on any other portion of the layout. The Kato Turntable Controller is only used to turn the bridge. The direction switch works the same for DC or DCC and simply turns the table clockwise or counter clockwise. Now you can enjoy this great new product with all of the power and features of DCC control. Here are a couple of videos demonstrating the setup and operation. A lower quality production, sorry this ain't Hollywood, but much more clear on setup and operation. One of my customers, Stephen Feldman, has shared a fantastically simple solution that must be passed on. Thanks Stephen! Turns out the turntable is power routing just like a Kato switch. Awesome! What this means is… blah, blah, blah… and then show an alternative wiring with a BIG WARNING about the potential problems. One of my customers, Stephen Feldman, has shared a fantastically simple solution that must be passed along. Thanks Stephen! It turns out the 20-283 Electric Turntable is power routing just like a Kato switch. Awesome! The bridge can be powered by the track it is aligned with if it is left unpowered. 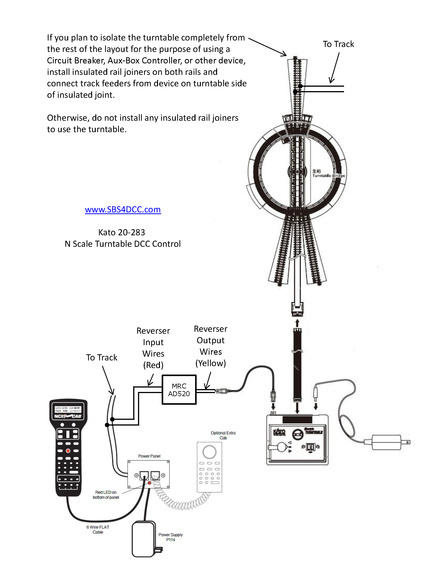 What this means is that it is possible to use the Turntable with DCC without the addition of the Auto-Reverser. There are a few caveat's to this approach so just be sure to do the do's and don't the dont's. The safest solution in all instances is to install the 20-283 Electric Turntable with an Auto Reverser. 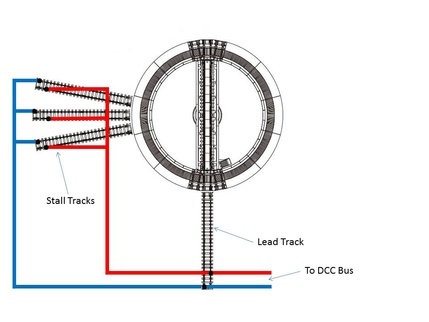 If you plan to have a full circle of stall tracks, powered opposing stall tracks, a wye’d lead track, run-through trackage, or other more complicated track plans, the Auto Reverser is still required. If your track plan is simple and you have no situations that create a short, then this may be the simplest solution for using the 20-283 Electric Turntable with DCC. I plan to have a full circle with mine as it will sit inside a Helix. I think it is more common than you suggest. Wye’d entrances. Run through trackage. Way too many possible combinations. If you want the stub track to stay powered when the bridge is away you must have the track powered. Now we are getting pretty deep in the what if’s and while I want to be accurate and informative, safe is sound and less is best. The safest solution in all instances is with a reverser. Less questions, less risk, less headache for me and all those who might have a problem. Frankly, this has already created a lot of unintended work. Adding in a new layer of “maybe it will work if” is not very appealing. 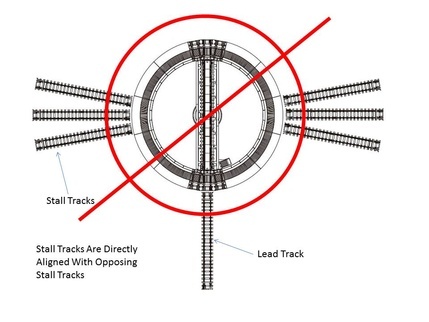 You can use this solution ONLY if your Stall Tracks are NEVER directly aligned with the Lead Track or Opposing Stall Tracks. 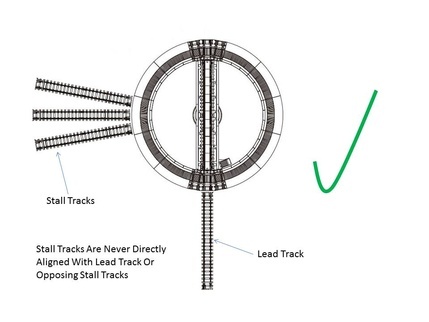 You CANNOT use this solution if your Stall Tracks are directly aligned with the Lead Track. You CANNOT use this solution if your Stall Tracks are directly aligned with Opposing Stall Tracks. The exception, yes there's always an exception, is this will actually work if you only power one side of the opposing tracks. Also be aware that the bridge will lose power in this approach when it moves away from the aligned track. 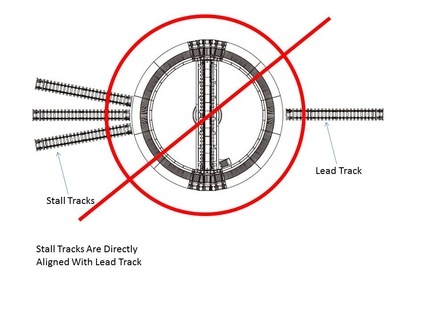 If you are running sound-equipped locos, this means your loco will lose sound and restart each time it comes into alignment with a powered track. If you don't run sound, no worries. If you do run sound and it matters to you, use an auto reverser. Wiring this simplified plan is very easy. 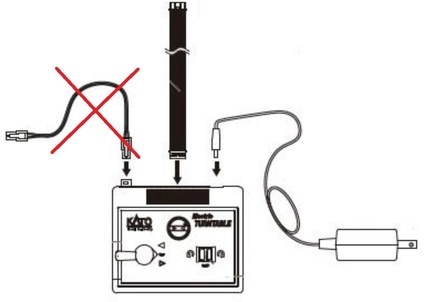 First, assemble the turntable and Turntable Controller per Kato's instructions except DO NOT connect the bridge track power cable (the one with the Green Connector) to the track or the Turntable Controller. Now, use the Kato Unitrack - 20-284 - Turntable Extension Track Feeder Kit to power the lead track and all stall tracks. You can tie all of these track connections together easily with the Kato Unitrack - 24-827 - 3-Way Extension Cord. Then connect the Kato Unitrack - 24-827 - 3-Way Extension Cord to the DCC bus making sure to connect right rail to right rail and left to left. Do not use any insulated rail joiners with this arrangement. And it's really just that simple. Operation is exactly the same as with the reverser.